We put a lot of consideration into the look, feel and durability of our exterior doors. After all, they need to make a great first impression while protecting your home. However, there’s another area of our home that demands just as much attention to detail when selecting a door: the patio. A great patio door maximizes your space, keeps your utility bills down, and provides a beautiful focal point in your home. 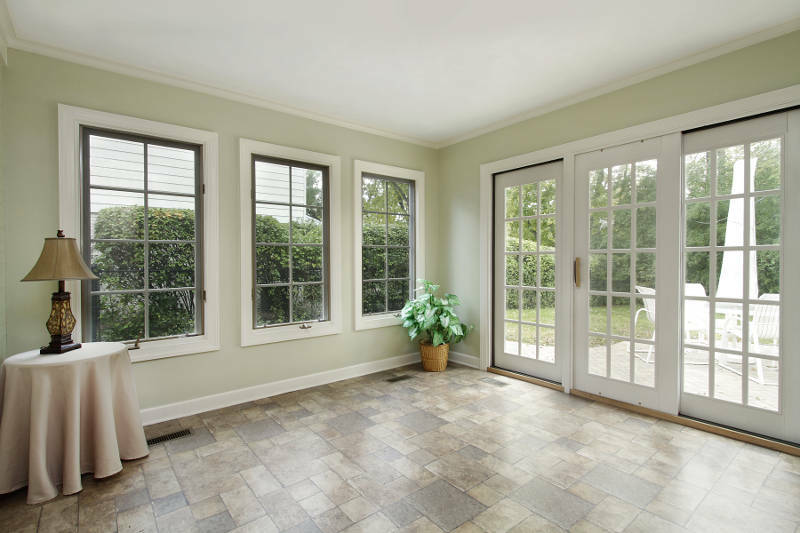 Here’s a guide to patio doors to help you select the right type for your house. Why Are Patio Doors So Important? Couldn’t you just hang up any old door and call it a day? You could, but you’d be missing out on an opportunity to substantially raise the appeal and value of your home. 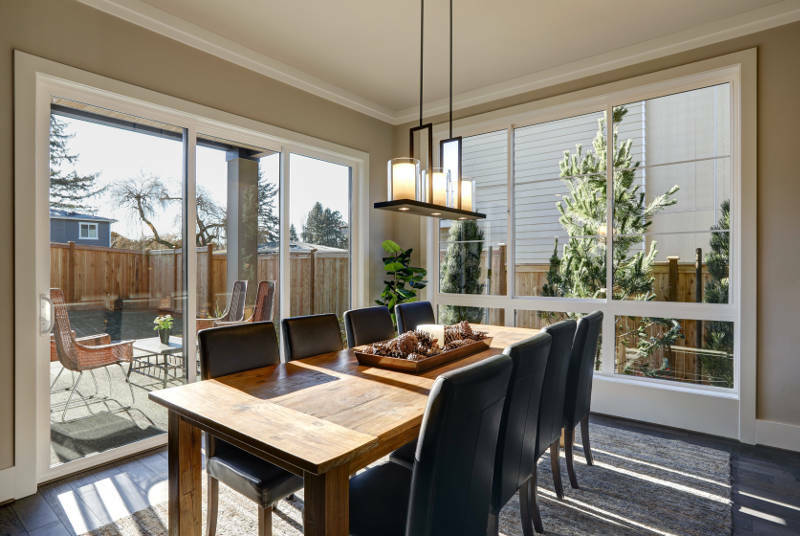 A patio is a great selling point on a home and often found on more upscale builds, so to avoid doing your research on patio doors is to do a disservice to your house. 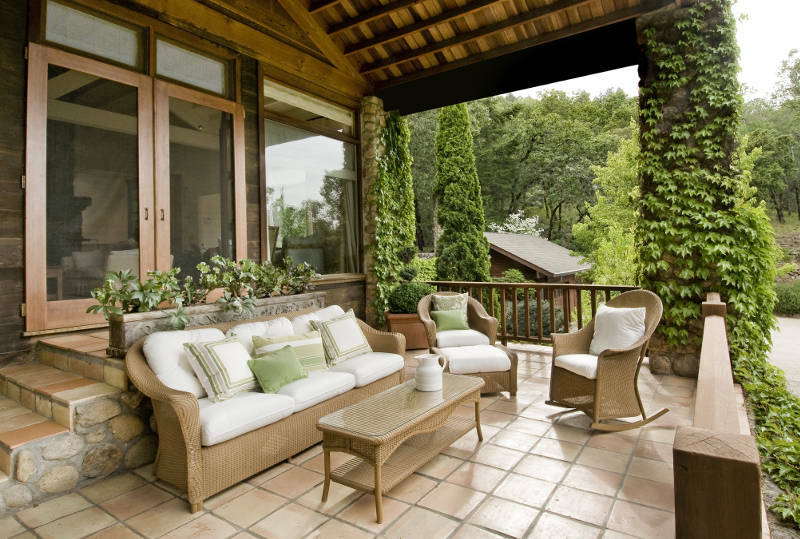 The right patio door can make a whole room pop, and lend a gracious, stylish air to outdoor entertainment. Additionally, glass patio doors which are built for energy efficiency can help keep your heating and cooling costs manageable. There are a few different types of door that work well for a patio, and one of the most popular options is the sliding patio door. These may also be called gliding doors, and are usually built with large panes of glass to let in the most natural light. One of the biggest benefits of sliding patio doors is that they allow you to maximize your space, both indoors and outdoors. They slide parallel to the wall, so they don’t swing out into your furniture or traffic path. They’re also extremely easy to open and close- it can be done with one finger. This is because they move along a sliding track. Folding patio doors, or bi-fold doors, have been trendy in certain seasons of home design and are making a comeback in some areas. One of the great things about bi-fold doors is their ability to help you bring the outside in when desired. They also don’t take up a lot of space when open, but aren’t suitable for large door openings. Folding patio doors don’t look as good as sliding or swinging patio doors and can detract from the look of a room. Also, they’re not as energy efficient, raising the cost of your energy bills. Swinging patio doors can be as simple as a standard single door, to as elaborate as a beautiful pair of ornate French doors. Some of the pros include increased security, and a traditional elegance that is unmatched by plain glass, while a possible down side is the space they require in order to open and close without bumping objects or people. They’re also extremely customizable. You can get one, two or three panels, have many hardware options and can change the direction in which it swings. If you end up going with swinging patio doors, your next move will be to determine whether they should swing to the inside or the outside. The most obvious decision maker for an in-swing door is how much space you have inside. Do you have a couch or fireplace right in the path that the door would bang on every time it is opened? What about your area rug – will the door curl up the edges? You also may want to consider that if your door has rain, ice or mud on it, you may be dripping it onto the floor when it opens. This type of door will swing out onto your patio. This is usually fine if you don’t have too many items arranged around your patio. One thing an out-swing patio door has going for it, is its weather-resistant quality. They have a tight seal which doesn’t affect how easily you can open and close the door, and keeps the rain out during a storm. These are always used in areas prone to tornadoes or hurricanes, since the door can’t be blown open by strong winds. As for security, both doors have their benefits. In-swing doors are hinged on the inside, but can be forced open by an intruder. Out-swing doors can’t be forced, but the hinges are on the exterior side. You can further enhance your protection by using deadbolt locks and extra-security hinges. The choice ultimately comes down to your personal preference, space limitations and climate considerations. Whatever style of patio door you select, there is a wide range of material available to suit your needs. Wood, vinyl, fiberglass, and metal are all used on residential patio doors. Wooden patio doors have a beautiful and timeless appearance. They’re heavy and can be stained any shade to match the aesthetic of your home. They reduce noise, energy costs, and break-ins. However, they do require more maintenance than other materials, including sealing and re-staining or painting occasionally. They may also warp or sag after a few years. The cost of a set of wooden patio doors varies greatly according to style and quality, but may range from $1000 to $2000+ installed. For a cost-effective option, vinyl is the best choice. They come in a wide range of colors and styles at the lowest prices. They’re also the most energy efficient options when it comes to sliding doors because of their foam insulated frames and argon gas filled-glass. Plus, vinyl is resistant to moisture so it won’t warp, rot or expand. As we previously mentioned, vinyl is best suited for sliding patio doors which consist of a large window and small frame. One of the most popular choices for a door is fiberglass, since it has the durability of metal, the low maintenance of vinyl, and the attractiveness of wood. Fiberglass patio doors come in a vast range of colors and styles to fit any home and can even mimic a realistic wood grain. Fiberglass is best suited for swinging patio doors because you need something that has a hollow, foam-filled core for better energy efficiency. Steel is also used to make patio doors. These are tough and inexpensive options, but they’re not well suited to painting and may rust or dent after a while. Much like fiberglass doors, steel patio doors are best suited for swinging patio door for the hollow core. Also, like vinyl, steel doesn’t warp or rot when exposed to moisture. It’s a fantastic option for your swinging patio door. Your patio doors have the opportunity to be a stunning focal point in your living room or kitchen. By taking into account not just price, but also style, color, security, weather and space limitations, you’ll be able to choose patio doors that’ll make you smile every day. Whether you need vinyl sliding patio doors or fiberglass and steel swinging patio doors, Feldco has you covered. We’re Peoria’s one stop shop when it comes to everything patio doors. Get a free quote now and see why over 350,000 homeowners have trusted us with their home improvement needs.